Mobile app analytics firm Flurry has released an updated version of one of its most popular research reports, first published three years ago. In the prior report, Mobile Apps: Money, Models and Loyalty, the company took an in-depth look into customer loyalty by app category. Today, Flurry does so again, focusing specifically on the 700,000+ applications that run on iPhone, iPad and maybe soon, the iPad Mini. 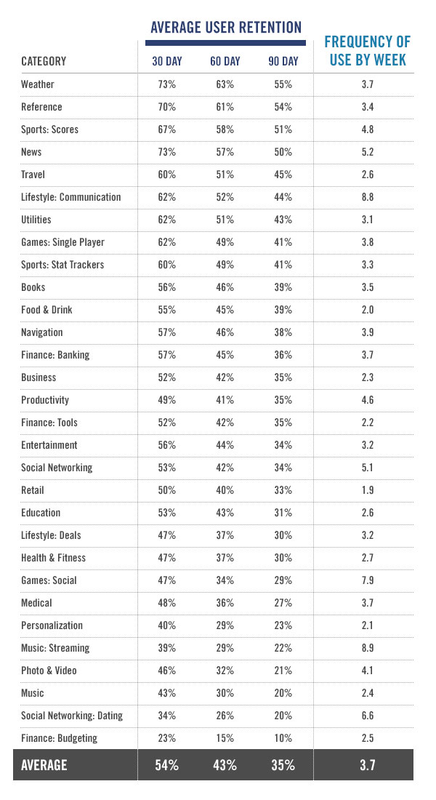 As with the original report, Flurry once again plots application categories on a matrix by how often they’re used, as compared with how long consumers continue to use them over time. 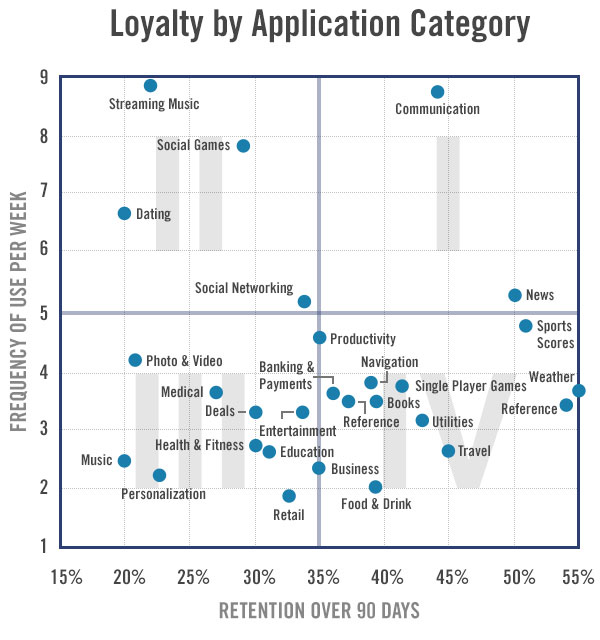 For the purposes of this study, Flurry looked at the 90-day retention window (plotted on the matrix’s x-axis) and the frequency of use per week (plotted on the y-axis). The data set involves a sample of apps used more than 1.7 billion times per week. Flurry has access to the data from a large number of apps because over 80,000 companies now use its Flurry Analytics offering across their over 230,000 published apps. The categories chosen for the new comparison come from those defined by Apple in its App Store, for the most part. However, when there were clusters of apps in a sub-category that were different from their parent category, Flurry then broke these out into their own category. For example, “Social Games” and “Single Player Games” were separated in this manner. As you can tell by the above chart, each quadrant contains many other app categories, some of which can seemingly go either way. Productivity and Business categories, for instance, sit right on the line between quadrant III and IV. By looking at the apps by quadrant, app developers can help determine what their business model should be. Quadrant I and IV are suited for subscription or advertising supported models, says Flurry, while II and III are better for one-time download fees. Also, quadrant II and IV (top left and bottom right) are best for in-app purchase models. In II, developers can offer users with additional content or features during times of intense usage, while in IV, returning users can be presented with new content or functionality during their repeat visits. Flurry compared its new data with that from the 2009 report and found that 90-day retention rates have jumped from 25% to 35% overall, while frequency of use declined from 6.7 to 3.7 today. The retention rates are higher because of increased app quality, Flurry suspects, but frequency drops are due to the large number of available apps, causing users to split their time across more and more applications. In 2009, there were 19 categories, and today there are 30.